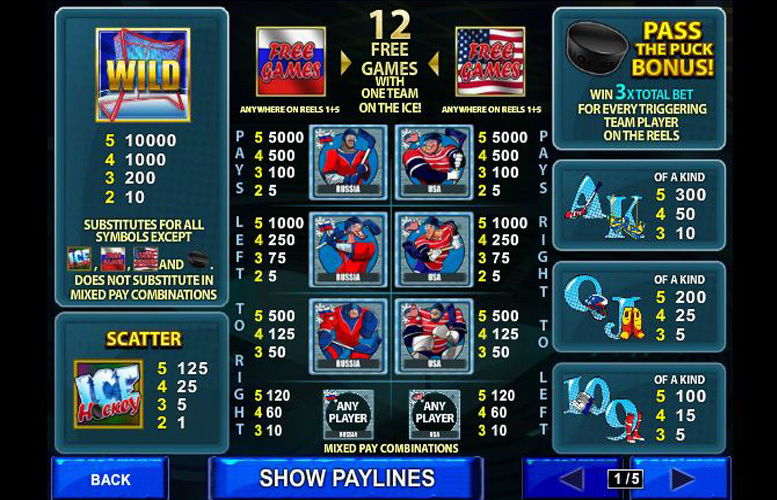 The Ice Hockey slot from Playtech beautifully highlights the skills and forward thinking of one of the world’s leading slot machine designers. It’s a unique game in that win lines run in both directions, and players can choose which symbols pay from left to right, and from right to left. From an initial look at the layout of the game, players would be forgiven for presuming that it’s going to be like many other slots. There are after all the typical five reels, and three rows of symbols from which players must spin wins from. Undoubtedly the greatest thing about the Ice Hockey slot is its unique approach to almost every aspect of gameplay. These features will be discussed in greater detail later in this article. There are options to set the number of coins you bet per line, and the value of each one. This means players have a huge amount of control over their bet sizing. Difficult to understand. Ice Hockey is by no means a simple slot. Players are advised to thoroughly read all the information in this guide, and the info section on the slot itself before clicking spin. There isn’t a great deal of visual variety on the slot. The gameplay features will likely make up for this for most players but those seeking the slickest graphics, and stunning cutscenes will be disappointed. Naturally, the symbols for the Ice Hockey slot come straight off the ice. There are a set of hockey nets, and a variety of different players from each team. The prizes for five-of-a-kind of each of these are listed below. Hockey nets (Wild symbol) = 10,000x the coin value. Biggest player = 5,000x the coin value. Smaller player = 1,000x the coin value. Goal keeper = 500x the coin value. Any combination of players = 120x the coin value. Where this game really shines is in its special features department. There are quite a few of them, and they aren’t exactly typical. Before players can begin the game, they’re asked to pick which teams will be facing off on the ice. There’s a list of several typical hockey nations to pick from: Finland, Sweden, Canada, USA, Russia, Germany, and Czech Republic. The home team’s players can win across the left to right win lines, and the away team can only win across the right to left win lines. Players can switch up the teams at any point during the game, and it doesn’t strictly matter which they select – the only differences between the teams are cosmetic. Each team has their own “free games” flag, and landing either nationality’s flag on reels one, and five simultaneously will award the player with 12 free games. During these spins, combinations will play in both directions, and only the team who were awarded the bonus are present on the reels during the round. If the player is lucky enough to land the puck symbol on reel two, with a home player to its left, or on reel four, with an away player to its right, they will initiate the “pass the puck” bonus. During this round, the puck will travel from one player on the team to all the others, earning 3x the coin value for each of the team members who touch it. This bonus is only available in the main game. Ace, or King = 300x the coin value. Queen, or Jack = 200x the coin value. 10, or 9 = 100x the coin value. 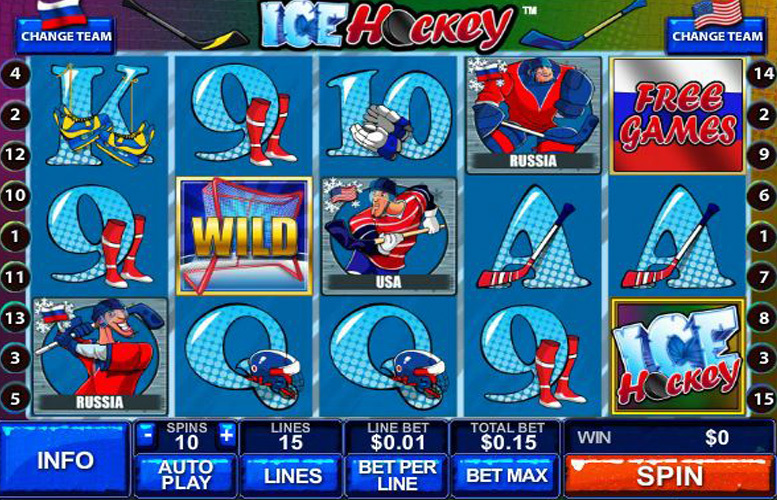 The Ice Hockey slot provides players with a lot of different ways to mix up their stakes. They can use up to a maximum fifteen pay lines, and bet between one and ten coins on each. They can also edit their coin value up to £5. This makes the maximum spin possible on the machine a sizable £750 a spin. If all variables are set to the minimum, the cost of each play will be just 1p. 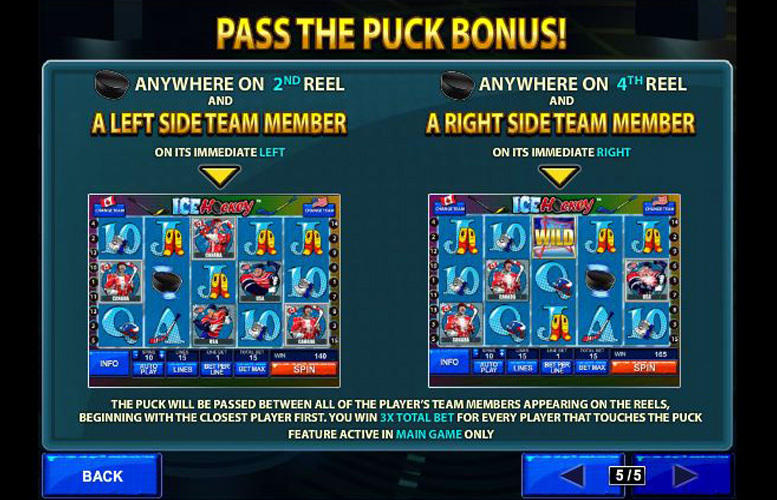 Whilst it’s by no means the best-looking machine from Playtech, the Ice Hockey slot makes up for this in many other ways. 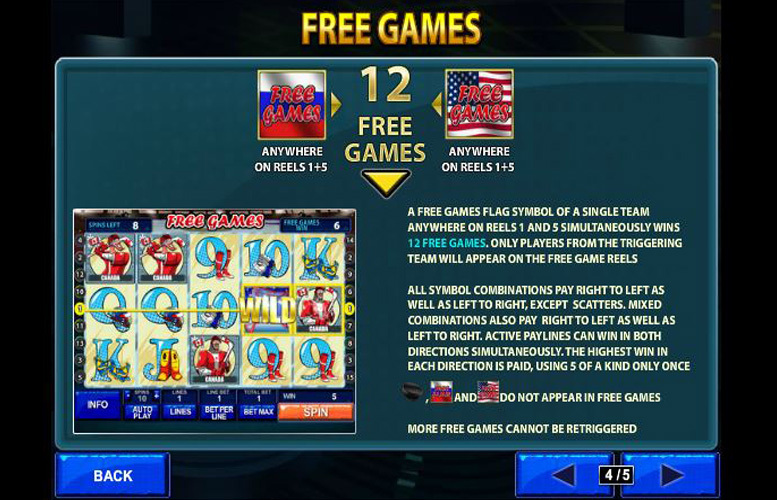 The innovative approach to all aspects of gameplay ensures a completely fresh experience when playing, and those who feel that slots can’t offer anything new, will be pleasantly surprised by this offering. This game has a rating of 5 / 5 with 419 total reviews by the users.